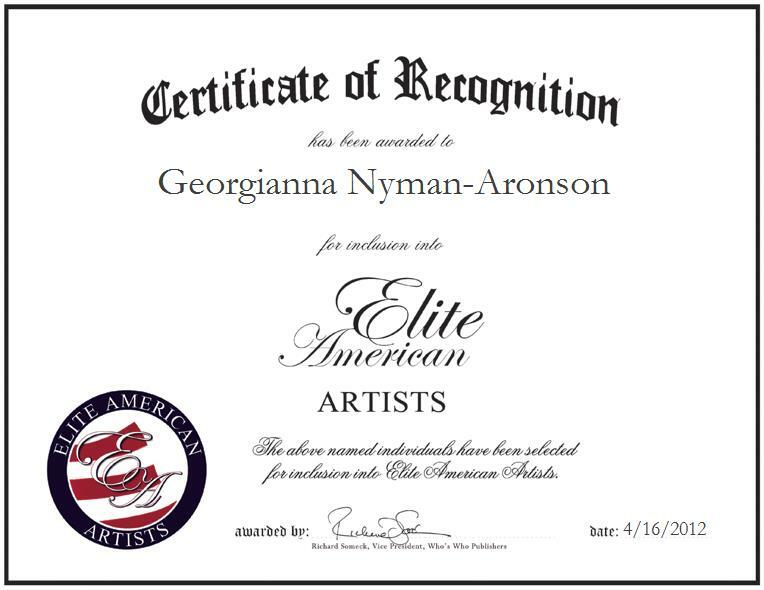 Georgianna Nyman-Aronson specializes in fine art portraiture at the Sudbury Portraiture Studio in Sudbury, Massachusetts. At her current post, she is responsible for creating paintings and handling commission sales. She has received a number of accolades and honors for her artwork, including the Boit Prize from the School of the Museum of Fine Arts in Boston; she was also named a Kate Morse Fellow of the Museum of Fine Arts in Boston in 1953. Her work was featured in the Nancy Lincoln Gallery in 1990; she received a Certificate of Merit from the National Academy Museum & School in New York in 1992, her work was featured in the Alter & Gil Gallery in Beverly Hills in 1999, and she has also received a Rhode Island Medal of Achievement in 2003. Inspired by an innate interest in people, Ms. Nyman-Aronson followed her dreams of professionally crafting artwork that would inspire others. Ms. Nyman-Aronson feels that it is easy to fall out of this profession, especially while raising a family. She took a break in her work between the ages of 27 and 56 to raise her family, and when her kids were back in school, she started up again. Now at the helm of her own art studio, she continues to strive for excellence in her every endeavor. She has garnered a reputation of distinction for painting portraits in the classic Renaissance style with style, elegance and grace that is not commonly represented in these days of “instant everything.” Her projects take at least one year to paint, as she feels that she has been separated by her peers by her precision, as many artists today lack self-discipline when painting in this complex and time-demanding manner, and would rather toss off a quick informal study and be done with it. She pinpoints this uninspiring approach as a mark of the superficial faddishness of the times, and as one reason why, when she was approached to paint people of a certain level of accomplishment, she went to the museums to view the Old Masters and not to the commercial galleries for inspiration. Informal portraiture has its place but it is not her major interest; as a portrait painter, Mrs. Nyman-Aronson has been focused on portrait commissions for institutions and private collectors. During her career, she has painted many dignitaries and public figures, as well as portraits for individual connoisseurs. Her most recent major undertaking started several years ago, when she was commissioned to paint life-sized portraits of the United States Supreme Court Justices. This is an ongoing project of which he has already completed three portraits. Her commissioned portraits include paintings of Chelsea Norell (1999), David Liesner (1995), Justice Anthony M. Kennedy (1995), Justice Clarence Thomas (1995), opera singer Richard Conrad (1994), actress Julie Harris (1994), and Hon. James R. Lawton (1994).